Entertainer Stephen Fry has spoken of the "ridiculous sense of elitism" at Cambridge University after accepting a degree from Anglia Ruskin University. Fry, a former Cambridge University student, accepted the honorary degree from the university - which is also based in Cambridge - on Tuesday. Fry, who lives in west Norfolk, said it was an honour to receive the award. He said the best thing about having gone to Cambridge University was never having to deal with not going there. "That's the only advantage. Some of the most ineffably stupid people I've ever met went to Cambridge University, it's no guarantee of anything, it's pretty much a lottery," he said. "Here at Anglia Ruskin University they have the advantage of not having all that pressure and not being surrounded by idiots who think they are in Brideshead Revisited but still have all the same architecture and facilities." 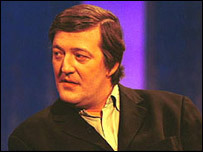 Fry, 48, an actor, comedian and director, said: "I feel chuffed and tickled pink, well tickled blue and gold anyway. One never believes one will grow up or is worthy of the degrees one has. "In a strange way a degree like this is a greater honour because one imagines them sitting around a table and thinking who shall we give a degree to. "We will take that chap who makes a fool of himself on the television. It's very sweet of them." Mr Fry already has an English degree from Queens' College at Cambridge University and said it was nice to have a Cambridge double.